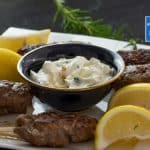 Keto Lamb Kofta Recipe - "Easy" Ground Meat Skewers - Delicious! These Lamb Koftas are a "delicious and easy" ground meat recipe. We leave any breading or flours out that some traditional recipes call for and replace the Yogurt dip with Sour Cream and Cucumber. Put all the ingredients, except the rosemary and oil, into a mixing bowl and mix well. Separate the meat into 6 portions and work into a long oval shape. Push the skewer through the center of the meat so that the meat covers one end of the skewer. Heat a non-stick frying pan or BBQ plate on high. Put a dash of olive oil in the frying pan once hot and place the koftas in the pan. Brush the koftas with olive oil using rosemary sprig then leave the sprig in the pan. Turn the koftas after 2 minutes or when charred on one side. Turn again after 2 minutes and reduce the heat to medium for 8 minutes. Keep an eye on the underside so as not to burn. Turn again and cook for a further 8 minutes or until cooked through. Remove and serve with a side of sour cream and cucumber dip.